All transactions are safe and secure with a reliable history in online purchasing behind each of our associates. Buy the Say Hello Parody t-shirt to own Scarface clothing and merchandise. Another gem in our selection of Scarface t-shirts, this creative parody features Tony Montana's infamous quote. 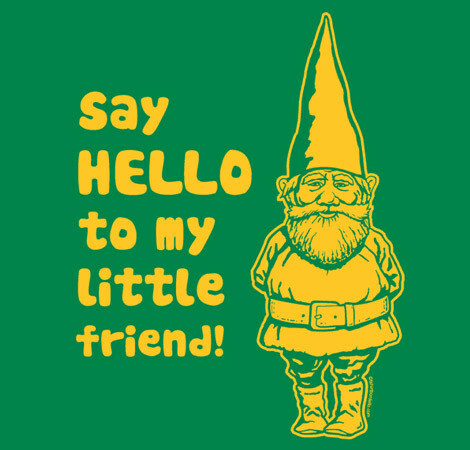 The Scarface movie quote, "Say hello to my little friend" appears next to an image of a gnome. Show off your gangster gnome to your friends and tell them that he's tougher than he looks. In addition to the Say Hello Parody tee above, browse the Scarface Clothing Gallery for more apparel like men's and women's clothes, kids shirts or hoodies.